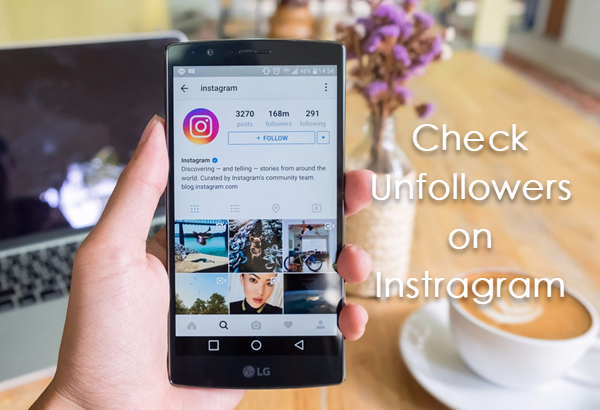 Home > Android Tips and Tricks > Instagram Unfollow Apps for Android: Who Unfollowed Me on Instagram? As we all know, Instagram is a popular social networking app where people share their best moments including pictures and videos with their friends. Instagram is just more than a social media platform, it’s a place where people showcase their various talent, connect to other enthusiasts, do business and what not. Since its establishment, Instagram has always been a popular choice among the youth, celebrities, politician, brands and other social tycoons. Through Instagram, people can be as creative as they want and can build a unique online image of themselves through the app. It can also help you showcase your stunning photos, day-to-day stories and videos to the world-wide community. You can follow your friends or people you adore, to have a look at their best moments. Instagram truly lets you explore a whole new world without even paying a penny or so. Every pleasant stuff is has some bad thing or the other, in Instagram it’s called “unfollowers”. Even if you are putting in a decent amount of effort to make your profile to make it worth a watch but still you get people who will choose to unfollow you. Sadly, Instagram itself doesn’t notify when someone just unfollows you on Instagram. Well, for this we have a solution for you. 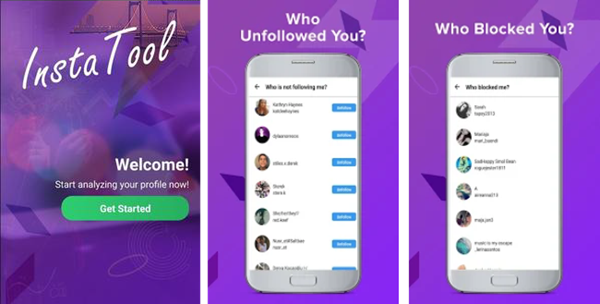 To help you get hold of ones who have unfollowed you, we have brought the 7 best Android apps that will let you know “Who unfollowed me on Instagram?”. Instagram is such an amazing app to use on Android and iPhone, however you can also post Instagram story on computer with these tricks, and you can even post Instagram story that longer than 15 seconds. There’s no one on the planet who wants people to unfollow them, but sadly to say that it does really happen. 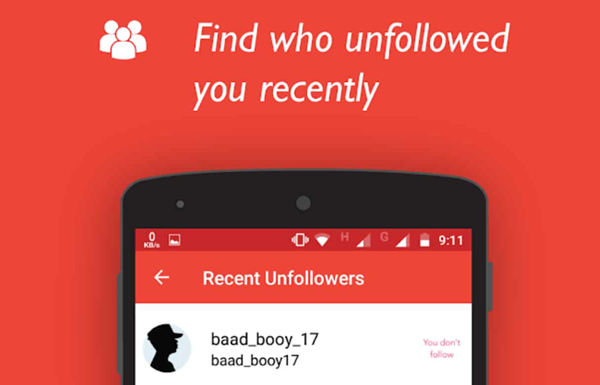 This app helps you to know who unfollowed you instantly. 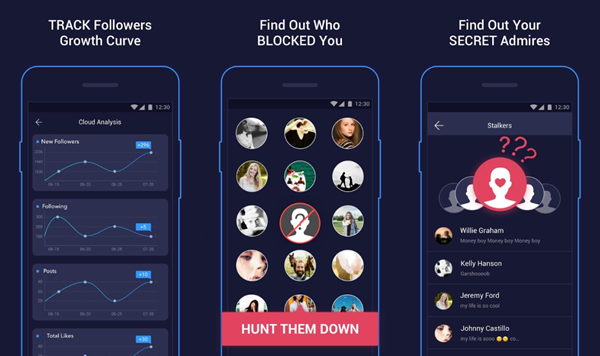 This is not just all, this app will also notify you even when someone chooses to block you. Apart from the negativity fact, unfollowers for Instagram also shows those fans and best friends who do not forget to like or comment on your Instagram posts. Not only does this app track the people who have chosen not to follow you but also you can track your newly gained followers and much more. So, lean back and track your unfollowers with Unfollowers for Instagram. As the name suggests, the Follow cop app acts as the cop of your Instagram account. This app is not a genuine unfollower app but it manages your Instagram profile efficiently. It has a unique feature of a Global shoutout that helps you get much more visibility on your Instagram account. 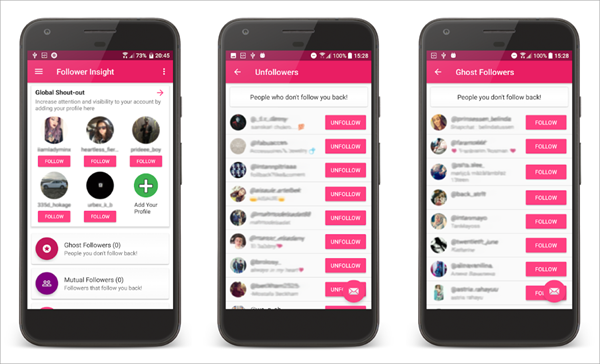 Learn more about your Instagram profile, keep a track of your unfollowers with the app. Want to make your tracking experience easy and reliable? The Unfollow for the Instagram app does that in a simple way by unfollowing the people who have no rights to stay on your profile. You can unfollow a single user or multiple users with just a tap. Also the app fetches you a list of people who do not follow you back. 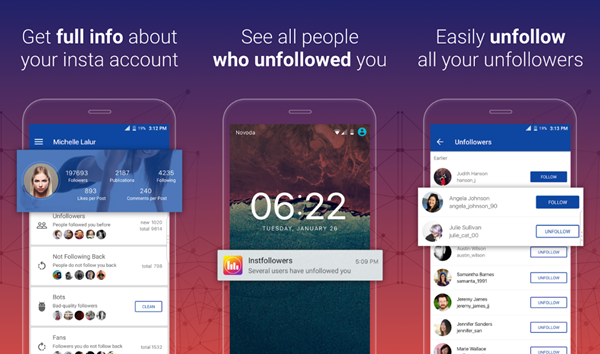 Unfollow for Instagram is a simple Android app that simply helps you to track users who do not follow you back on Instagram and even allows you to unfollow them as well. Followers Chief is a simple Android app that’s ad-free to make sure your tracking is much easier without any disturbance. Say, you own a popular Instagram account, it is nearly impossible to unfollow every single user who doesn’t follow you back. Well surprisingly, with this app, you can unfollow nearly 200 users at once. Get hold of all the statistics of your followers as well as your unfollowers. This app also gives you a list of your best friends who most often comment and like your posts. So now, simply manage your statistics and popularity on Instagram with Followers Chief app on Anrdroid. The name of the app might be a might sound extraordinary, but “Unfollowers and Followers Analytics for Instagram” is a one-stop solution to track down all your problems on Instagram. All of these can be seen via insta tracker. Get a quick insta report and a complete analytics of your Instagram profile with just one click. From now on, easily unfollow people from the list and just make sure that you only have loyal Instagram followers on your profile. Unfollowers and Ghost Followers is a free Android app available at Play Store. This app gives you a complete analysis of your Instagram account. 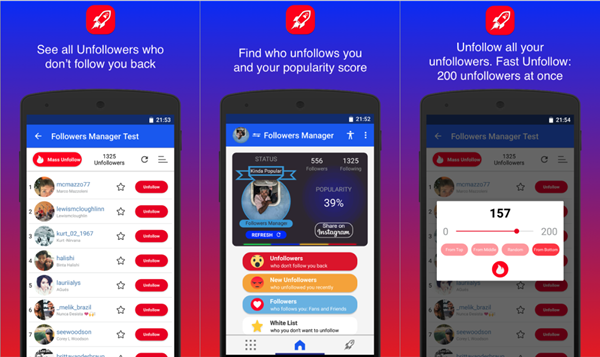 The app tells you about your unfollowers, ghost followers, mutual followers and much more. 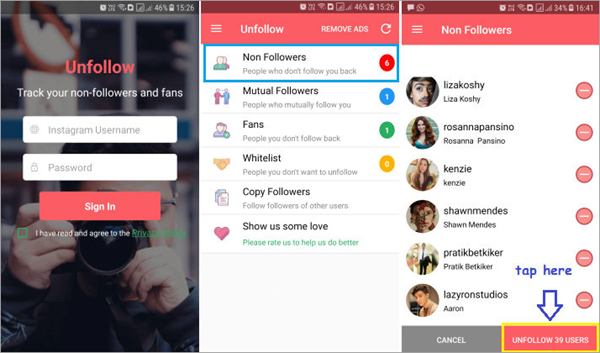 You can directly unfollow or follow your fans from the app. The app provides you with short info about the number of your followers and following. The app also helps you promote yourself in two ways – by Global shoutout and through Media shoutout. Need an all in one tracker for Instagram? With the Follower tracker for Instagram app you can easily use to maximize your performance in Instagram. Unfollow people who don’t follow you back, and hunt down those who have blocked you. You can even find out your secret admirers and know your loyal followers as well. This app gives you much more options to enhance your usage. Also the easily track your performance shows most or least liked and commented posts. Like all other apps this one too Is available for free at the Play Store. Well, these were our top 7 Android apps that will help keep track of your Instagram unfollowers, stalkers, ghost followers and fans. All these have different specialities but all achieve their main motto to keep a track of the unfollowers of your account. All of them are free to download from the Play Store and you can hover there to download the apps instantly. Well, some are always free and some require in-app purchase to unlock the premium features. Use every app wisely to help secure your Instagram account!